Here is a very cool application Twitkut, developed by Ankit Ahuja. 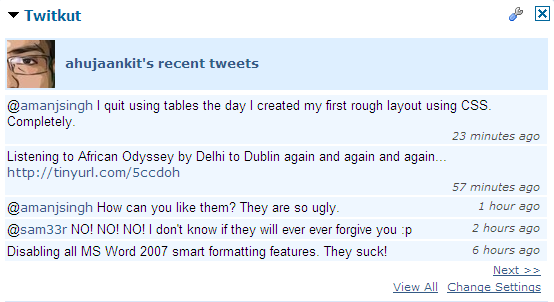 Twitkut displays your recent tweets on your Orkut profile page. It also shows you which of your friends are using Twitkut so that you can follow them. It can also shows you combined recent tweets so you don’t have to follow them separately on Twitter. To add this application to your Orkut page, simply navigate to Twitkut Application Page and add this application to your profile. Ð¯ Ñ‚Ð¾Ð¶Ðµ Ð²Ñ€ÐµÐ¼ÐµÐ½Ð°Ð¼Ð¸ Ñ‚Ð°ÐºÐ¾Ðµ Ð²Ð¸Ð¶Ñƒ, Ð½Ð¾ ÐºÐ°Ðº-Ñ‚Ð¾ Ñ€Ð°Ð½ÐµÐµ Ð½Ðµ Ð¿Ñ€Ð¸Ð´Ð°Ð²Ð°Ð» ÑÑ‚Ð¾Ð¼Ñƒ Ð·Ð½Ð°Ñ‡ÐµÐ½Ð¸Ñ.